When Microsoft introduced Storage Spaces Direct with Windows Server 2016, I was really excited about Microsoft’s entry into hyper-converged infrastructure. No longer were IT administrators tied to purchasing expensive and proprietary SANs. They could now use industry-standard interconnects, x86 servers, and local drives. Microsoft promised simplicity, high performance, easy scalability, simpler operations, and lower costs with Storage Spaces Direct and it has delivered. In our customer stories, our customers talk about these attributes over and over. But data center computing continues to evolve. Now customers want and need the flexibility to expand from on-prem to the cloud, for a future-proof, long-term approach. Hybrid cloud also allows for taking advantage of innovation in the cloud such as artificial intelligence and IoT. Microsoft offers two ways to get hybrid cloud benefits from your data center: Azure Stack and Azure Stack HCI. Azure Stack is an extension of Azure to consistently build and run hybrid applications across cloud boundaries using Azure IaaS and PaaS services. It brings the agility and innovation of cloud computing to on-prem environments, helping to accelerate cloud adoption. Azure Stack HCI uses the same Hyper-V based software-defined compute, storage, and networking as Azure Stack, for customers who want to keep running existing apps on-prem in a familiar way. 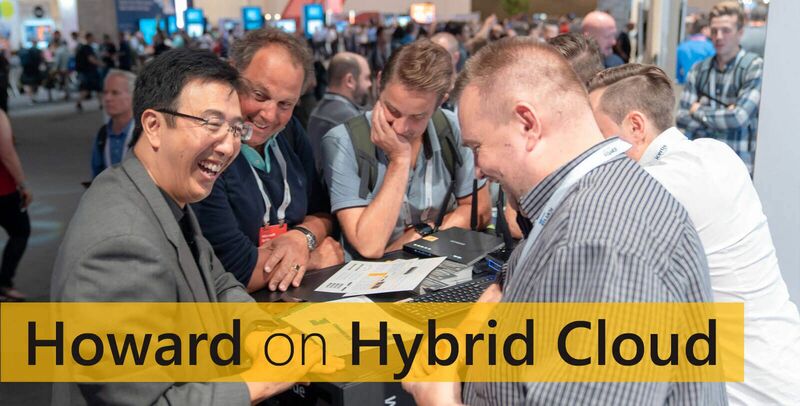 But now they can connect to Azure for hybrid cloud scenarios such as offsite backup and cloud-based monitoring. Azure Stack HCI builds upon the foundation of the Windows Server Software-Defined (WSSD) program, which includes intense integration testing to prove pre-configured solutions from a Microsoft partner can handle the demands of HCI. It helps get customers replace aging servers and storage infrastructure, consolidate virtualized workloads, and gain cloud efficiencies on-prem, without lengthy design and build times. DataON has several validated Azure Stack HCI solutions available now, with additional pre-configured solutions completing testing and validation with Microsoft. To help customers manage their Microsoft hybrid cloud environment, Microsoft has Windows Admin Center, a reimagined experience for management for Windows Server. It makes it simpler and easier to connect existing deployments of Windows Server to Azure services such as Azure Backup, Azure File Sync, disaster recovery, and more, without disrupting applications and infrastructure. DataON adds to the Windows Admin Center experience with MUST extension for Windows Admin Center, with features such as disk mapping, historic data reporting, system alerts, and call-home service. And soon you’ll be able to take advantage of Azure hybrid operations like Azure monitoring through DataON MUST monitoring agents, as well as Azure services provisioning from our cloud services. If you’re one of the many IT decision makers that’s looking to replace an aging server and storage infrastructure, choose a validated Azure Stack HCI solution to make sure you have a solution that’s able to evolve as your workloads and business needs evolve.